You Matter Cards: Free to a Good Home! Thanks to you, our ‘You Matter’ Card Fulfillment Center is looking mighty sparse. Only 550 card packs remain! As a YuMMie, you know better than anyone how impactful even one card share can be. Please take a moment to invite a friend, school, or organization to sign-up for the You Matter Marathon. Let’s unleash every possible ounce of You Matter magic into the world. Just forward them this email or send them a link to our website: www.youmattermarathon.com. 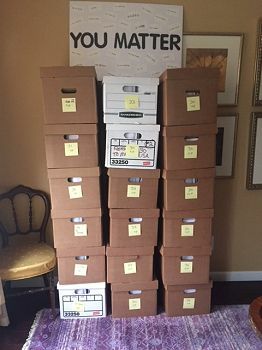 My Thanksgiving wish is for our You Matter Card Fulfillment Center/dining room to be empty of cards by the time my family gathers in gratitude. With your help, I know my wish will come true. Donna, your post date reminded me of my sister who shares the same birthday date. I sent her 50 random presents to celebrate each year of her life. Thanks for the sweet memory! Thanks for your note. We don’t have extra cards right now but you will receive your 30 cards for free in mid-October. Please help, I just received my package in the mail with my 30 free cards, the envelope was ripped and there is only 7 cards in it. I really love making people smile and was looking forward to sharing those cards. Is there a way to get more cards? Hi Rachel, We are very sorry to hear that your cards arrived in such a tattered state. We will mail you a new set of cards this week. You Matter! Would like to have some you matter cards please I know they would mean a lot to certain people. Hi Gerry, You can sign up here. Or you can email me your mailing address to [email protected] and I’ll manually add you to our list. Thank you! You Matter! Hi Igrah, We are mailing your free 30 You Matter cards to you this week. You Matter! Hi my name is Weston Taylor and I am an administrator and Spanish teacher at a small public charter school and I am interested in these cards. I received one from a co-worker and it made my day. Could I have some to pass out to my students and teachers? Hi Weston, Thank you for your interest in the You Matter Marathon! We won’t start sending out free You Matter cards until mid-October 2019. In the meantime, you can order You Matter cards from our store at this link: https://squareup.com/store/minuteman-press-13, or print your own cards here by clicking this link and downloading the template: http://bit.ly/2Q3K0zM. Please also sign up (https://youmattermarathon.com/sign-up-for-the-ymm/) for the 2019 You Matter Marathon as an Ambassador for your school and we’ll send you 30 free cards in October. It will be wonderful to have you as a You Matter Marathon Ambassador!